Playtested it at Hero difficulty, and it's a challenge. Maybe somewhere between Hero and Titan in terms of difficulty; if you're not good at modifying your cities, you may have a bad time. Do note that the prices of commodities are not standardized; this is a neo-dark-age campaign; people would rather be safe in a city than be paid high wages, and some resources are scarce. A couple of quick tips: raiding your enemies with frigates can get you the resources you need. Dionysus is very useful. You'll need to consider what monsters you may face (look at the mythology tab) when choosing which gods to worship and what resources to stockpile. As always, I check back in on this stuff from time to time, so leave a comment if something's screwy and I'll see if I can sort it. Good Map, but after the first episode no colony locations show on world map. Just finish it, hard map on Olympian. No bug, But there is some weak NPC attack between the strong one, there will be ones that can be bribe with only 1 denarii. 1 map is very hard on Olympian level, I discard my personal rule and built on efficient such as disconnect road and choke line of towers to survive the first 20 years, Gods come very frequently almost every year, rival cities also. I would suggest giving more time or more city to trade with at the beginning. Maybe some leeway like the first episode is about reaching population around 1-2000 and no attack. The story is good, and the way the colony played turned out was also good. However, the one with no water is very very hard, I change to another one as it's a lot easier. Good looking map and world map. It's like "Yesterday once more" Every Zeus-us-us still shine. Your map is good like other old people in here made. If your final is for bachelor degree, that's mean I'm a decade older than you. Wow! What's is the first time you playing this game? Not bad for a title, man. :P Hope you continue giving us adventures, haha!! Quite a neat-looking map too. 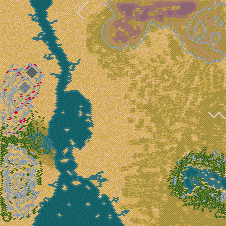 @Buznag The colonies are right on the north and south edges of the map, but they show up on the default 1024x768/unmodded graphics I run. Do you have a different resolution setting for your mode? @Pegasus03 Natural disasters are going to happen in a city that Atlas and Hades have both taken a personal dislike to. I'll grant that there's a lot of invasions early on, and I'm thinking I'll reduce those a bit; I like the theme of people constantly attacking your city, but if you're playing on high difficulty, the swarm is probably too intense. I was initially going to guide the player into choosing the northern colony before the southern, because it's about 7x easier, and I went back and forth on the "no fountains" thing, but I thought it fit the theme too well to leave off. Hi. I very much liked the first episode, but then I encountered the same problem as another person here: no colony place to choose. I changed the resolution to what you proposed, but this did not help, so I cannot finish the scenario :( If multiple players encounter the same problem, maybe it's a good idea to reconsider the locations of colonies? Just a thought. The first episode is very enjoyable though.